Abstract: It is explained why strong interference fringes can occur even when two beams with very different intensities are superimposed. It is well known that interference of optical beams (e.g. laser beams) can lead to fancy interference patterns. What often surprises people, however, is that interference fringes can be rather pronounced even in situations whether the intensities of the two interfering beams are very different. As an example, would you expect a strong interference effect when one beam has a 100 times smaller intensity than the other one? The calculation is actually simple. The amplitude of the stronger beam is only 10 times higher, as the intensity is proportional to the square of the amplitude. In the extreme cases of destructive and constructive interference, the total amplitude is 90% and 110%, respectively, compared with that of the stronger beam alone. From that we see that the total intensity varies between 81% and 121% of that of the stronger beam alone. And that effect may already be clearly visible! 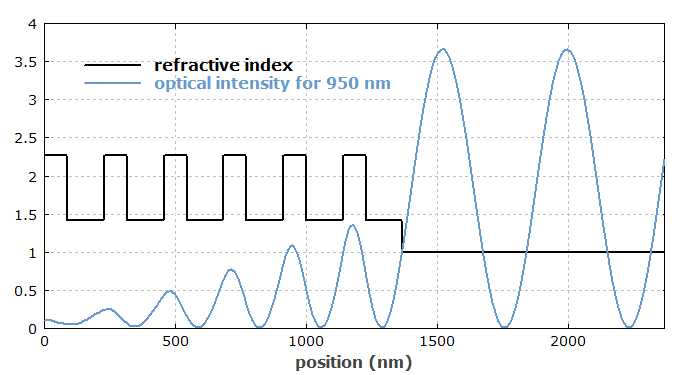 As another example, consider the optical intensity inside and outside a dielectric mirror structure for a monochromatic incident beam, as shown in the graph above. The counterpropagating beams form a standing-wave pattern. The initially surprising finding is that we appear to get completely destructive interference, even though the mirror reflectivity at the relevant wavelength is only 83.6%. Despite that imbalance of intensities, interference can get the resulting intensity down to below 1% of the incident intensity, and in the graph this can hardly be distinguished from zero. Take these effects are a warning: interference effects are in many situations stronger than one would expect without having in mind that interference means adding amplitudes, not intensities.